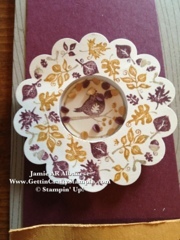 Getting Crafty with Jamie: Falling for Fall! I loooove our Shaker Frames and it really allows to embrace the falling leaves of Fall! 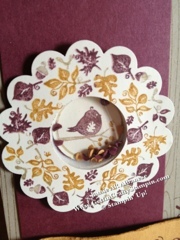 I then used Bravo Burgundy, More Mustard and Crumb Cake markers to color in this lovely Fall Bird stamp from the Four Seasons Hostess Stamp. I then used the 2 3/8" scallop punch to punch it out. The 1" circle punch to punch out the bird center. 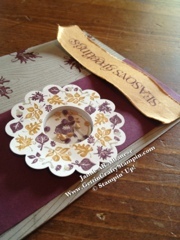 SNAIL adhesive holds the lil bird down on this strip of Bravo Burgundy paper. 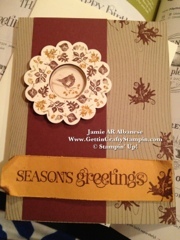 I then used the lil Shaker Frame to hold frame lil punched Bravo Burgundy and More Mustard paper lil circles. I love how they will float! Remove the cover of the frame and adhere a window sheet. This seals in the floating leaves and allows them to move about. 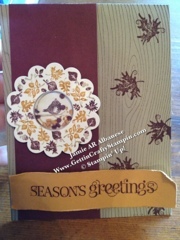 I then used Mini Glue Dots to adhere the top/scallop punched fall leaves. 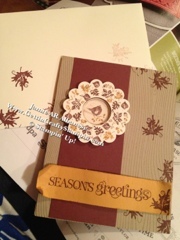 The lil burgundy stamped "falling leaves" on the side is just lovely. Here Fall Leaves float about. How cool is that?!?!! 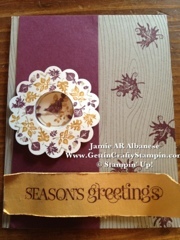 The Curly Cute "Season's Greetings" is stamped w/Bravo Burgundy ink on More Mustard paper. Using the Paper Snips to rough the edges, then using my fingernail to break down the fibers it adds a maturity and elegance to the card. 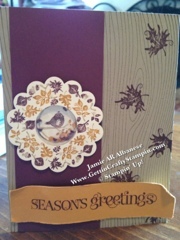 I used the Stampin' Dimensional Adhesive to create the movement to the paper. Ok go nature, Fall and create a cool element to your card. 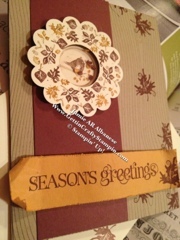 I love that the Color Coach combined these colors and gave a great seasonal feel! Happy Fall Y'All, it's here and I'm sooo glad!